Shandong maples have amazing beauty and complexity. 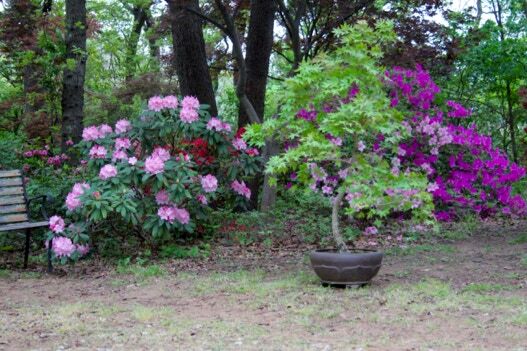 Zone 4 or 5 hardy and drought, wind, heat, and alkaline soil tolerate, they have very dense and hard, yet flexible wood to withstand ice and storms. Ever since the Texas A&M Superstar award and nurseries like Metro Maples that not only grow them, but also introduce dramatically different cultivars, they are becoming increasingly popular everywhere. 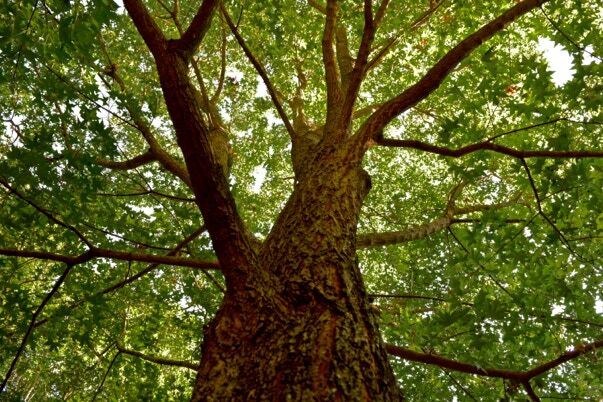 They are ornamental and strong trees. A 16 year old Acer truncatum ‘Fire Dragon’ ® at Metro Maples, Fort Worth, TX showing the typical spreading multi-trunk habit with many branches. The tree is about 30 feet tall and 25 feet wide. 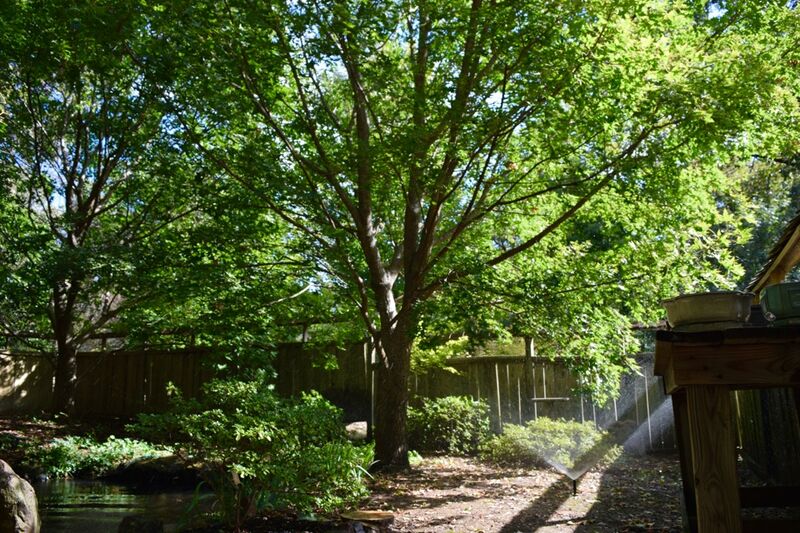 Most truncatum are medium size trees 35 tall and wide and do well in small urban lots and soil where they can provide some useful cooling shade. They are low multi-trunk trees but can be pruned-up higher if desired. Leaves on this variety are a medium glossy green and fall colors are red, not the typical yellow fall color of Shandong maples. It has a distinctive leaf shape with a cordate leaf base, non-wavy leaf margins, and one or two bold teeth on the 5 lobes. That’s a ‘Fire Dragon’ ® fall color leaf in the heading/menu section. It is planted 20 feet away from the one on the left and this seems to be a good minimum for a great natural spreading shape on both. Shantung maples do well planted closer together but you will get taller and narrower trees. Truncatum make nice specimen trees or grouped. Here’s a dozen Shandong maples just getting ready to turn fall colors, planted 10 feet apart and pruned at Alcon Labs, Fort Worth, TX. 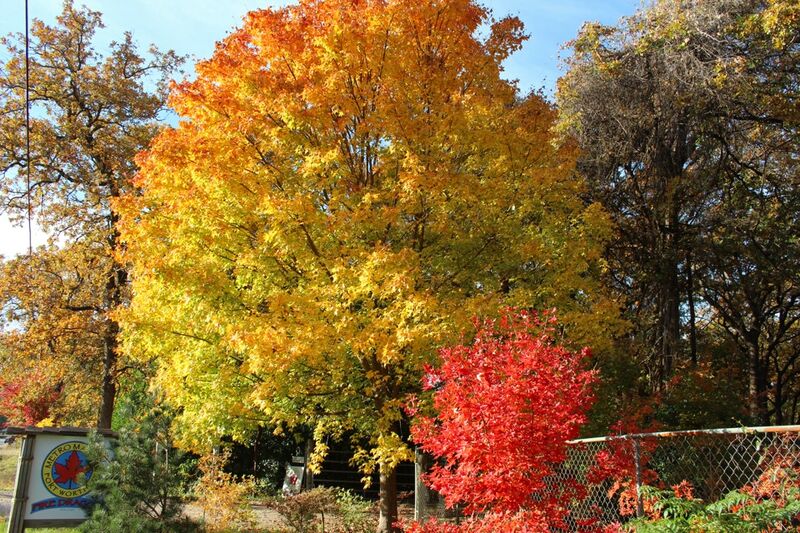 There are now lots of shapes, sizes and colors of Shandong maples to choose from like the yellow leaf semi-dwarf ‘Super Dragon’ ® and dwarf mounding small leaf ‘Baby Dragon’ ®. Since Shandong maple are tough and indestructible they can also be nice potted trees and the dwarfs make fantastic bonsai. Repotting is every 2 or 3 years and use a well draining coarse potting mix with aggregate like expanded shale for best results. Cut away half the roots and any thick woody roots when repotting. Keep the top pruned in mid-winter to maintain the size and shape. Slow release fertilizer in spring and perhaps add a calcium source like gypsum. Pruning of branches is best done in mid-winter, or in summer when the sap flow is slow. They can be pruned very close leaving only 1/4 inch of the branch collar and they will heal quickly and flat. The one on the left was pruned leaving a bigger branch collar and it will look lumpy for a while. Also don’t forget about another good feature. The beautiful ornamental bark . Shandong maple have an open crown and the fibrous roots are not aggressive. This allows the growth of many plants underneath it. Branches have held up as good or better than any tree from strong winds and from extremely heavy ice coatings, like those that have occurred in Oklahoma and Kansas. About the only way to kill one is from water logged soils so make sure it is planted on a high spot, not in a low spot that collects water. NOTE: They can be harmed by the use of lawn weed & feeds. This small Shandong is shown in June, 2007 in Clinton, Arkansas. Earlier that April on Easter there was a several day hard freeze event after everything had leafed out. Temperatures were down to the upper teens and did not go above freezing for several days. Many native tree branches were killed and even the ginkgo were damaged, but this guy had no damage. Even the young leaves did not freeze and fall off. Here are a couple of Shandong with fall colors after an early hard freeze that occurred 2 weeks before usual fall color time.